Etica e politica per l'ambiente - Giuseppe Di Maria S.p.A.
Di Maria’s Paint Factory has always been attentive to the preservation of the environment and respect for nature. 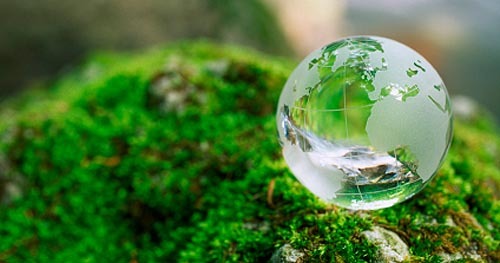 Our primary goal is to achieve the full satisfaction of our customers respecting environmental requirements. We ground our Business choices on the use of appropriate resources and tools to a proper environmental policy. Laboratory research and the use of appropriate technologies: continuous updating of new methodologies and new means of production, on the cogent product choice legislation. Materials and facilities are always coherent with the environmental improvement goals in order to provide customers with a wide range of products responding to market demands and environmental sustainability. Respect for the Environment: we implement the most suitable means, such as water purification systems, dust abatement, total distillation of exhausted solvents, etc. in accordance with Environment, Health and Safety of Workers. Continuous improvement of the Quality and Environment Management System: in order to keep the system under control, in a dynamic vision, projected to improve product and business processes. 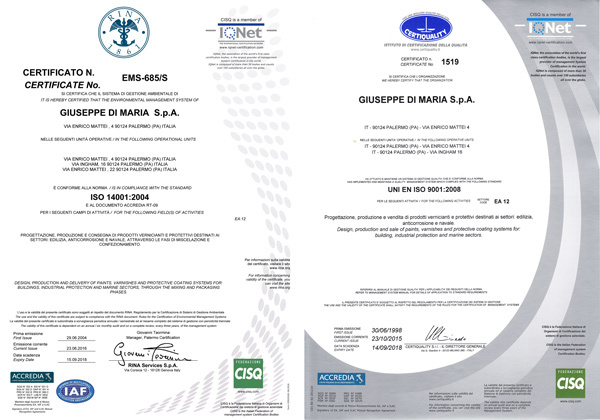 We develop the introduced management system in compliance with UNI EN ISO 9001:2008 and ISO 14001: 2004 standards. It represents the reference point and guide for specific operational responsibilities. In addition to safeguarding the environment, Di Maria’s Paint Factory policies focuses on the well-being and the security of employees and on the valorisation of artistic and sport heritage. On several occasions the Company has supported sports teams, cultural exhibition and sports events..